Four differentiated math activities on a PowerPoint that can be customized to your class. 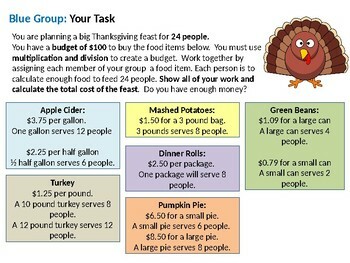 Blue Group (High Group) - challenged with planning a big Thanksgiving feast for 24 people. 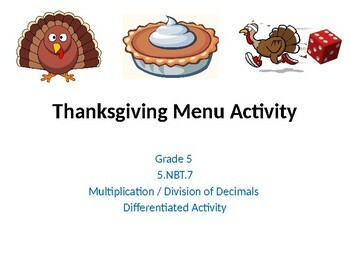 Students will have to multiply and divide decimals for various food items. 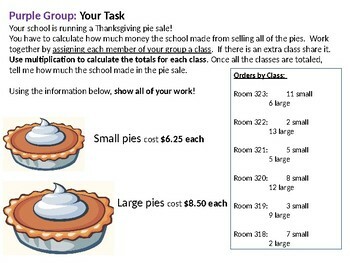 Purple Group (On level - High) - challenged with calculating the sale of large and small pumpkin pies for different classrooms. Using decimal multiplication they need to find out which class sold the most pie and total how much the pie sale made altogether. 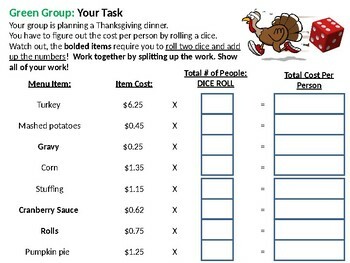 Green Group (On Level - Low) - challenged with planning a Thanksgiving dinner by rolling dice (some items require two dice for double digit) multiplication. Each group has a coversheet that can be printed out and referred to in group work. You may also print and use the data collection sheets that go with each group. Each group also has an exit ticket to fill out or verbally explain. This exercise is designed to address 5.NBT.7.